So far today, there has been no news alerts, security alerts or anything else and it’s almost 11.00 in the morning – it’s really very exciting actually. There is a strange unease in the air – as we just don’t seem to be used to this calm, and by now have usually heard of some trouble somewhere in the country kicking off by this time of the morning. I do hope we can do a whole 24 hours like this – that would be a first for a while and would be extremely welcome. So many people are homeless as tribe has gone against tribe, neighbour against neighbour, just because of the difference in their names. The red cross has been struggling to get up to the likes of the more North Western regions because of the continuous trouble on the roads, so lets hope that today is the day they get lucky and get some aid up those ways. Yesterday, after the little get together of the warring parties and the mediator Kofi Annan, they all stood about for a spot of tea and a small relaxed chat. Jolly good show, you’d say, but actually the fact that Raila and Kibaki could not look each other in the eye was really quite telling, and when Kofi Annan insisted they shook hands for all the jolly nice press people who’d turned up, the look on their faces said it all. He said if they had had to shake hands for more than the one minute that they did, bones would have been broken. It was not a handshake as more of a gripping contest! 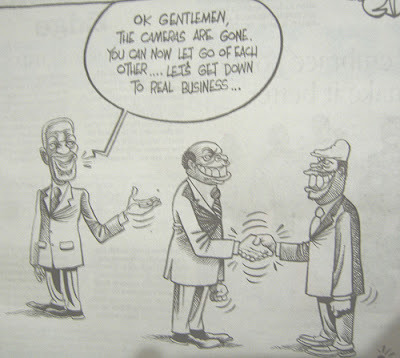 Do you think the country is waiting to see what is going to happen with the talks between Tweedledum and Tweedledee – or is it raining heavily in the Rift Valley? I hope and pray that it is the former and that Kenya can get through 24 hours without violence. Longer would be good, but I will settle for 24 hours to start with. Sun is shining so lets hope its the former. I have been reading through your blog and hope to God that calm returns so that you can go backto blogging about dating, moms who lunch etc…inane stuff we take for granted. I sit here and I wonder how Kenya came to this and how we will ever heal from this. Looking through your posts from December 27, its like a badly scripted horror story unfolding. One can only hope we have come to the end and the credits are rolling….. I am the anon reader who blogged a few days ago about peace returning by February and by God I still believe that. I know that the blood lettting will end, the political and economic crisis may continue well into this year but please Kenyans stop killing each other and leave this nightmare in January. Call me unrealitistic because we only have one day left in January. But hope is all we have left….and I’ll be damned if I don’t cling on to it as hard as I can.